FATAL PICTURES is proud to announce “FAMILIAR”, a new Horror short starring Robert Nolan, Astida Auza and Cathryn Hostick as the seemingly idyllic yet ultimately doomed Dodd Family. Written/Directed by Richard Powell, Produced by Zach Green (FATAL PICTURES) Cinematography & Co Producer Michael Jari Davidson shot on RED Digital Cinema. 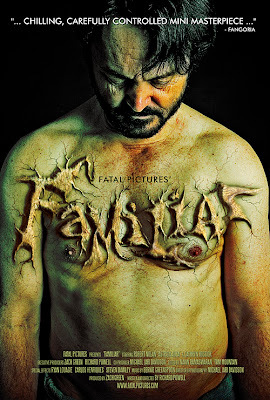 Special FX for the film provided by Ryan Louagie, Carlos Henriques & Steven Dawley (The Butcher Shop). Music & Sound Design by Bernie Greenspoon.